Amid the Islamic State's continued destruction of cultural landmarks in the ancient Syrian city of Palmyra, archeologists and scholars are replicating one of the city's surviving monuments in London and New York, in a gesture of defiance. 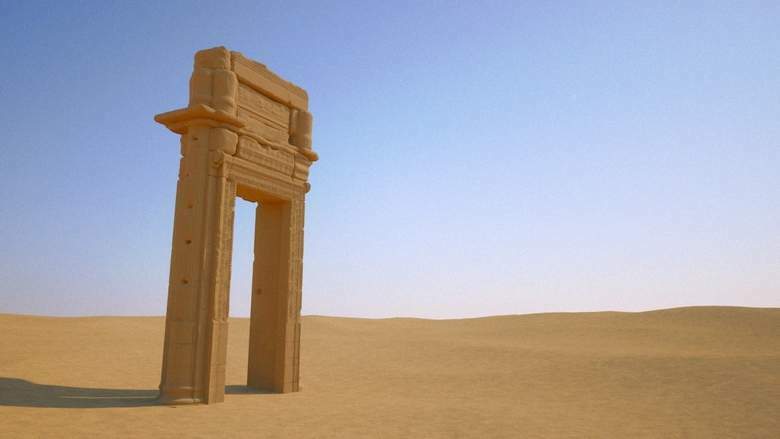 It's the 49-foot (15 meter) tall archway that leads to the site of the 2,000-year-old Temple of Bel, and still survives after the temple has been all but razed by IS militants. The group began destroying pre-Islamic history and antiquities after it seized Palmyra from government forces in May. IS enforces an extreme interpretation of Islamic law in its self-styled "caliphate" and brands statues and other historical artifacts as idolatrous. The group has also been accused of smuggling some artifacts to fund its war effort. In September, UNESCO, the United Nations' culture organization, released satellite images showing that IS used explosives to destroy the Temple of Bel, which dates back to 32 AD. Now the world heritage organization is working with the Institute for Digital Archaeology or IDA — a joint venture between Harvard and Oxford Universities and Dubai's Museum of the Future — to replicate the site's entry arch for display in London's Trafalgar Square and New York's Times Square. The venture will use digital imaging and 3D printing to create off-site individual parts, which will then be assembled in the two popular tourist destinations. "It is really a political statement, a call to action, to draw attention to what is happening in Syria and Iraq and now Libya," Roger Michel, the IDA's executive director, told the Times: We are saying to them 'if you destroy something we can rebuild it again'. The symbolic value of these sites is enormous. We are restoring dignity to people." In August, IS beheaded an elderly Syrian antiquities scholar in Palmyra, according to reports. Militants captured 81-year-old Khaled al-Asaad, the former director-general of Palmyra's antiquities operations and museums, a month before killing him. They reportedly interrogated him in an attempt to find treasures in the UNESCO World Heritage Site, according to the head of the Damascus Antiquities and Museums Department. Pictures circulated on IS-linked social media accounts appearing to show al-Asaad's bloodied body tied to a traffic light post in the middle of a main road, with his severed head between his feet. A sign tied to the corpse identifies it as al-Asaad and describes him as an "apostate" and "supporter of the Alawite regime," in reference to the minority religious group of Syrian President Bashar al-Assad. UNESCO officials have frequently accused IS of "cultural cleansing." "Violent extremists don't destroy heritage as a collateral damage, they target systematically monuments and sites to strike societies at their core," UNESCO's director-general Irina Bokova said in July.